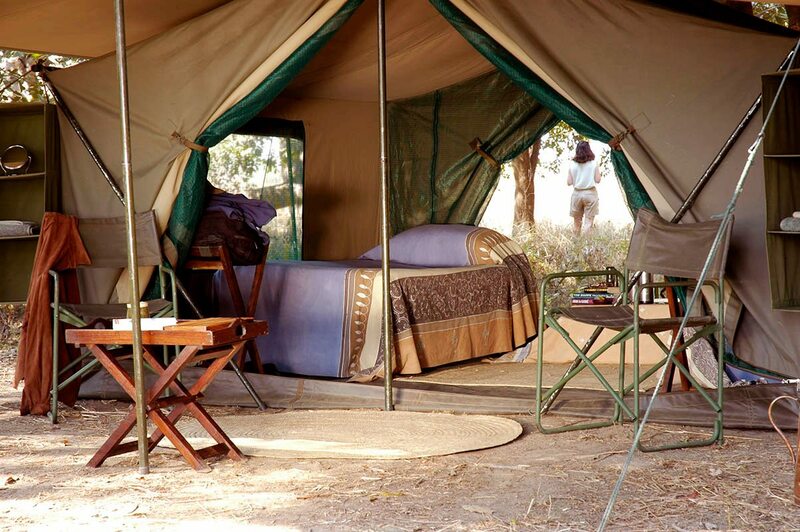 If a game drive is like watching a movie, then a walking and camping adventure is the equivalent of reading the book. This type of luxury Zambia safari allows you to connect with the bush in a literal sense, take the time for closer examinations of tracks and flowers and roam where our ancestors once did. 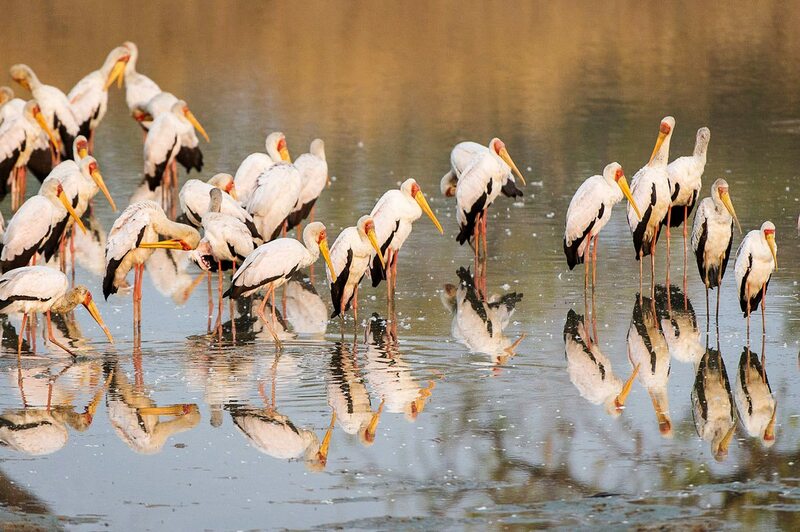 An in-depth experience exploring the intense concentrations of wildlife and pristine wilderness scenery of South Luangwa National Park. 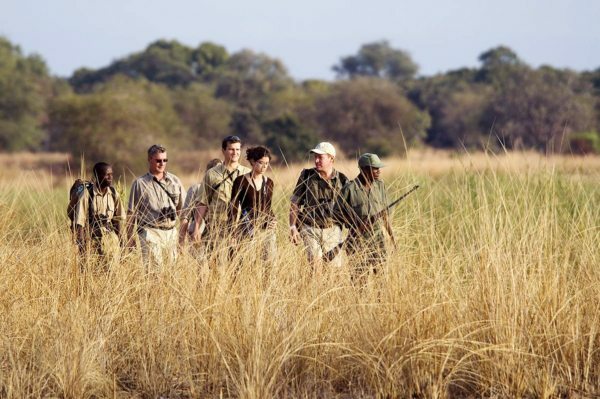 The opportunity to spend not just a couple of hours but several days on foot in a pristine Zambian reserve, absorb knowledge about the local flora and fauna, and be thrilled by close (but very safe) encounters with big game. 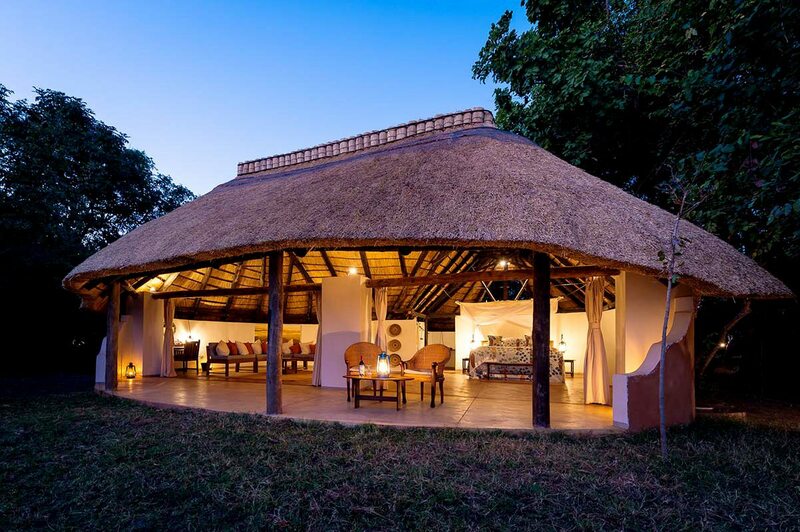 Luxury safari camps Nkwali and Tena Tena perch on the banks of the Luangwa River, with commanding views and rustic charm and elegance. 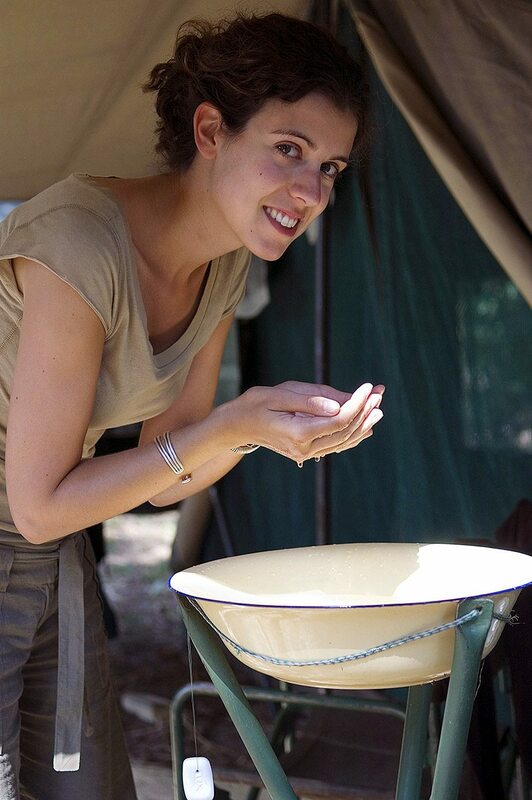 Stays in slightly more basic mobile camps while on the walking safari offer pampering in the form of attention to detail and attentive service. For more information see Nkwali and Tena Tena. 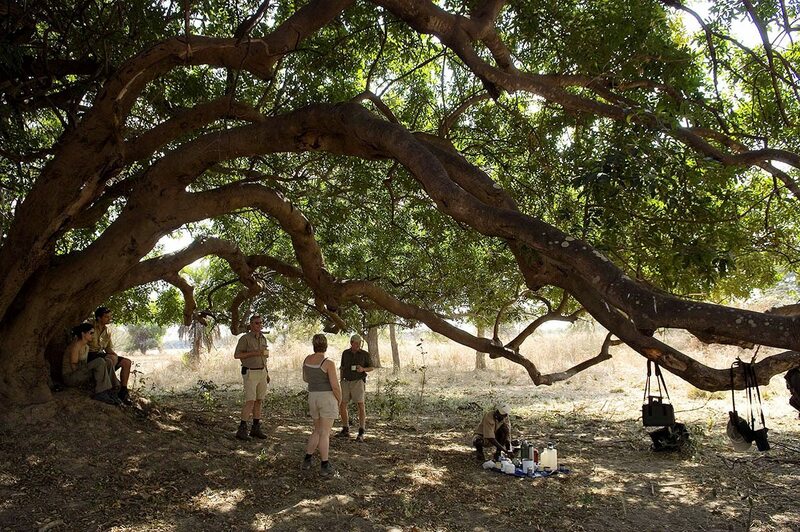 Our stay at Nkwali was the perfect preparation for our South Luangwa walking and camping experience. 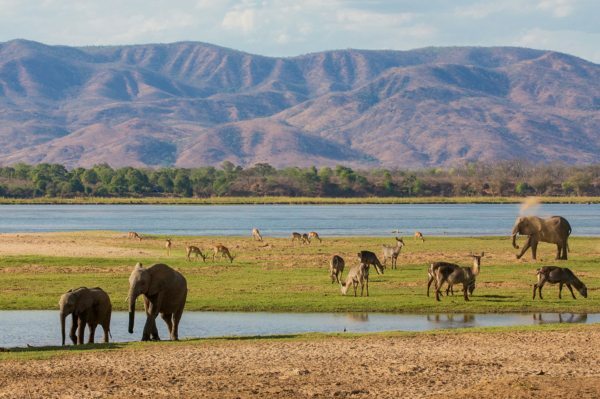 Located just outside the national park, the proximity of the Luangwa River, the uplifting views and the sawing call of leopard during dinner all seemed to be positive portents for our luxury Zambian safari. Naturally, the excellent meal, starlit shower in our chalet’s open-air en-suite bathroom and a wonderful night’s sleep all helped, while the first leopard was answered by either a lover or rival from across the water. The last thing I saw as I drifted off was my new walking boots, just crying out for dust. After an early breakfast at Nkwali – no hardship due to our excitement – we climbed up into the safari 4×4 vehicle for the drive to the Mupamadzi River, a trip which took us through remote parts of the national park.Further away from Nkwali we noticed that the wildlife became shyer, and we were intrigued to see how they would react to ‘meeting’ us on foot. Looking out for game and ticking off more species in our birding checklist kept us more than entertained all the way to our first mobile camp – rather than fly camping in South Luangwa for a night from a lodge, we’d be staying at three different bush campsites over the next five days. My first chance to test my boots came as we limbered up with a short walk around the camp, before sundowners and a starlit dinner.At Nkwali we’d heard but not seen leopard; now we were hot on the trail of one. We saw where the big cat had passed during the night, and left perfect prints in the mud by the river. Her tracks led ultimately to dense undergrowth where we couldn’t follow. Instead our guide taught us how to work out the speed and size of an elephant from its tracks, and how it was impossible for a human to overtake one at walking pace. The calligraphy of tracks led ultimately to our second campsite – the staff had struck, moved and pitched camp while we’d been walking!On our third day our camp didn’t move, but we certainly weren’t stationary. We embarked on a leisurely stroll around the area and became so engrossed in what we were learning about the magnificent (and occasionally, rather spiny) trees of South Luangwa that we were surprised to discover that we’d arrived back at our tent at lunchtime. After a siesta to recover from our exertions, we went on an even shorter walk, this time hopping from sandbar to sandbar as we observed the many species of wading and diving birds that were making the most of the shallower stretches of the river.Our small human migration continued on our fourth day as we listened to more tales of the riverbank on a walk that mirrored the bends of the Mupamadzi en route to our third campsite. We were almost there when our guide halted us – his keen ears had detected elephant drinking around the next curve of the river. He carefully checked the wind direction, then beckoned us forward and a few minutes later, from behind the trunk of a giant mahogany, we watched in delight as our new neighbours slaked their thirst and need to play and splash. 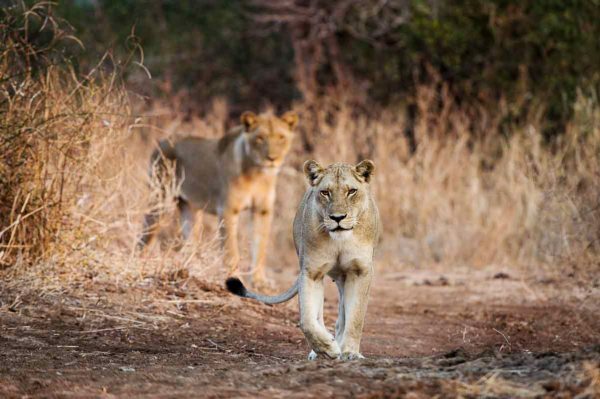 They formed quite a welcome committee.It seemed that the cats of South Luangwa were particularly vocal at night, and we awoke long before dawn on day five as the roar of a lion intruded upon our dreams. 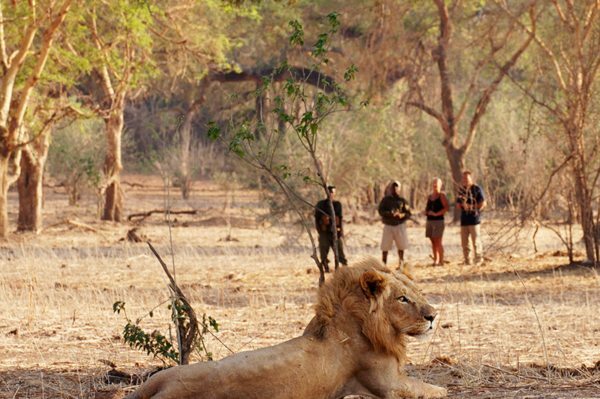 Over breakfast, we peppered our guide with questions about the wisdom of approaching lion on foot. He took the tracking and approach towards two females snoozing between the forever-stilled legs of a dead giraffe entirely in his stride. Unlike ours, I don’t believe his heart rate increased by more than a beat during the eternity when the one female – alert to the click of a camera shutter – lifted her head and gazed straight at us. After an early breakfast at Nkwali – no hardship due to our excitement – we climbed up into the safari 4×4 vehicle for the drive to the Mupamadzi River, a trip which took us through remote parts of the national park. Further away from Nkwali we noticed that the wildlife became shyer, and we were intrigued to see how they would react to ‘meeting’ us on foot. 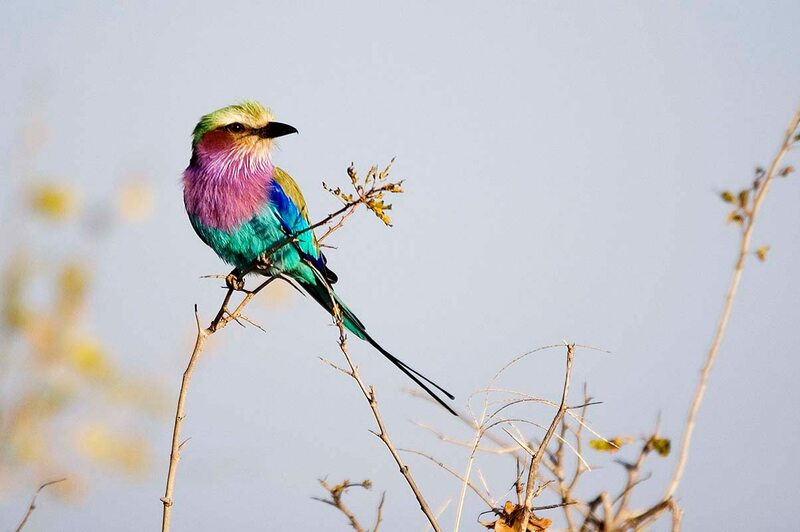 Looking out for game and ticking off more species in our birding checklist kept us more than entertained all the way to our first mobile camp – rather than fly camping in South Luangwa for a night from a lodge, we’d be staying at three different bush campsites over the next five days. My first chance to test my boots came as we limbered up with a short walk around the camp, before sundowners and a starlit dinner. At Nkwali we’d heard but not seen leopard; now we were hot on the trail of one. We saw where the big cat had passed during the night, and left perfect prints in the mud by the river. Her tracks led ultimately to dense undergrowth where we couldn’t follow. Instead our guide taught us how to work out the speed and size of an elephant from its tracks, and how it was impossible for a human to overtake one at walking pace. The calligraphy of tracks led ultimately to our second campsite – the staff had struck, moved and pitched camp while we’d been walking! On our third day our camp didn’t move, but we certainly weren’t stationary. 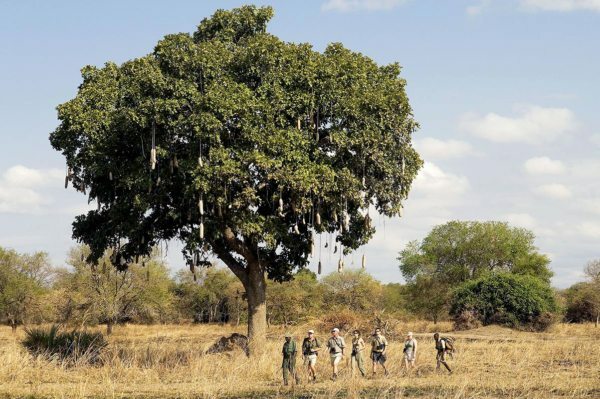 We embarked on a leisurely stroll around the area and became so engrossed in what we were learning about the magnificent (and occasionally, rather spiny) trees of South Luangwa that we were surprised to discover that we’d arrived back at our tent at lunchtime. 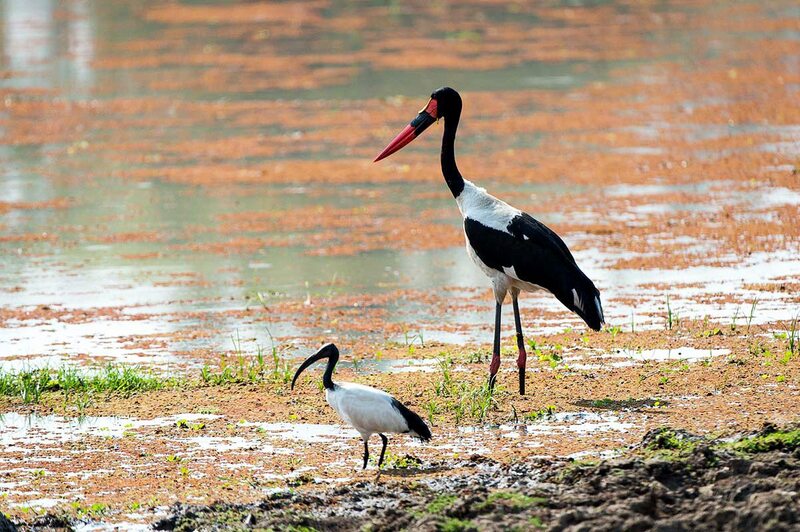 After a siesta to recover from our exertions, we went on an even shorter walk, this time hopping from sandbar to sandbar as we observed the many species of wading and diving birds that were making the most of the shallower stretches of the river. Our small human migration continued on our fourth day as we listened to more tales of the riverbank on a walk that mirrored the bends of the Mupamadzi en route to our third campsite. We were almost there when our guide halted us – his keen ears had detected elephant drinking around the next curve of the river. 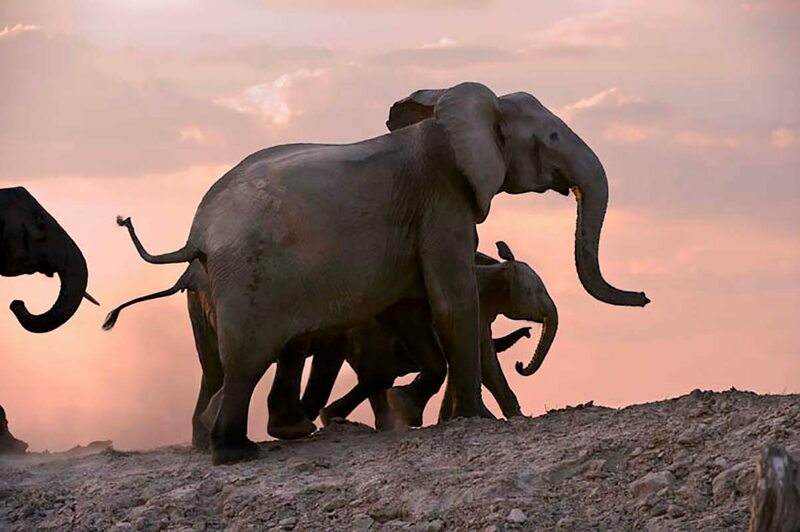 He carefully checked the wind direction, then beckoned us forward and a few minutes later, from behind the trunk of a giant mahogany, we watched in delight as our new neighbours slaked their thirst and need to play and splash. They formed quite a welcome committee. 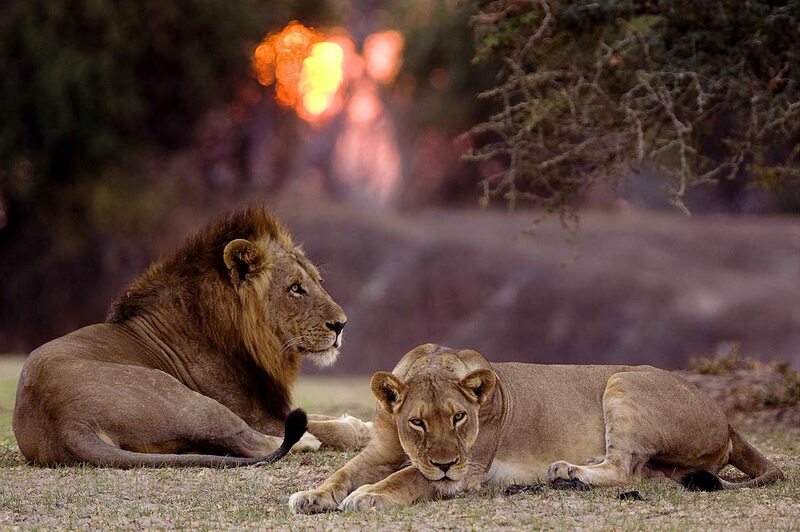 It seemed that the cats of South Luangwa were particularly vocal at night, and we awoke long before dawn on day five as the roar of a lion intruded upon our dreams. Over breakfast, we peppered our guide with questions about the wisdom of approaching lion on foot. He took the tracking and approach towards two females snoozing between the forever-stilled legs of a dead giraffe entirely in his stride. Unlike ours, I don’t believe his heart rate increased by more than a beat during the eternity when the one female – alert to the click of a camera shutter – lifted her head and gazed straight at us. 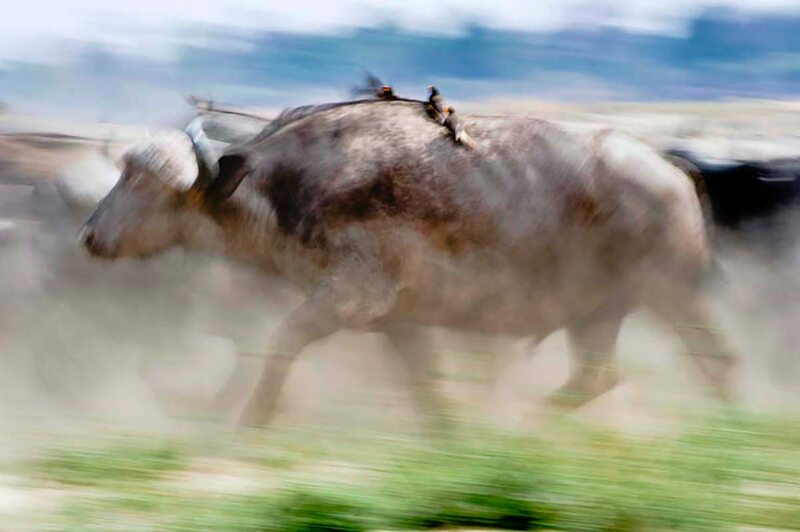 More than one friend had described Tena Tena as their all-time favourite safari camp, and so our levels of anticipation rose during the journey there. From our final mobile campsite, a vehicle (remember those?) transferred us the Luangwa River crossing point, where the Tena Tena boat collected us.Tena Tena was an absolute joy, and we were delighted to find that after our slightly circuitous walking safari, we were now looking out across a wide river meander. Our journey had brought us to the remote Nsefu sector of the park, where the sandy paths and repurposed tree trunks that were key features of Tena Tena were entirely appropriate. I symbolically hung my boots over a low bough – my idea of a trophy – and we relaxed in the dappled shade of mahogany trees. The afternoon slipped by as we wrote in our journals and watched elephant come down to drink.After spending several days with just our small walking group for company, we decided it was time to be more gregarious on our last full day. Our visit to Kawaza Village and the local primary school was the perfect antidote to our recent solitude. The headmaster seamlessly integrated our appearance into her geography lesson about transport – we were prime examples of walkers – and the game scout who’d been on safari with us overcame his shyness to introduce us to his wife and young son at their home. His son was too young for school, but was teaching himself to walk as we sipped tea and exchanged smiles. 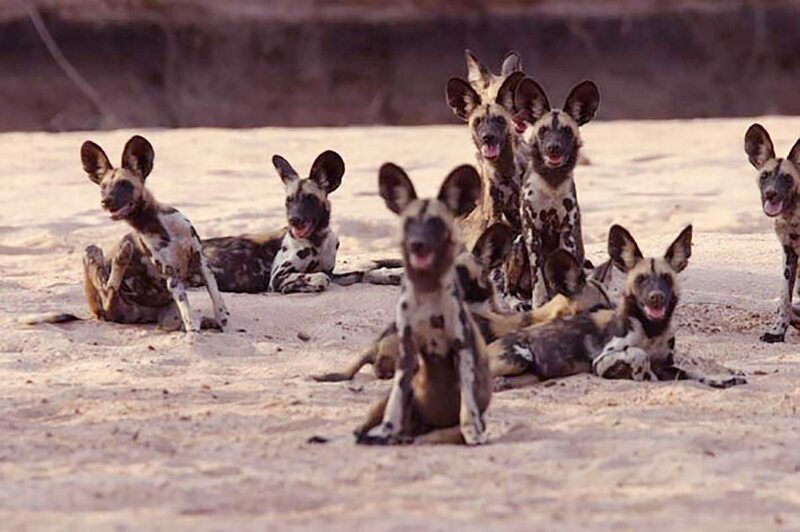 More than one friend had described Tena Tena as their all-time favourite safari camp, and so our levels of anticipation rose during the journey there. From our final mobile campsite, a vehicle (remember those?) transferred us the Luangwa River crossing point, where the Tena Tena boat collected us. Tena Tena was an absolute joy, and we were delighted to find that after our slightly circuitous walking safari, we were now looking out across a wide river meander. Our journey had brought us to the remote Nsefu sector of the park, where the sandy paths and repurposed tree trunks that were key features of Tena Tena were entirely appropriate. I symbolically hung my boots over a low bough – my idea of a trophy – and we relaxed in the dappled shade of mahogany trees. The afternoon slipped by as we wrote in our journals and watched elephant come down to drink. After spending several days with just our small walking group for company, we decided it was time to be more gregarious on our last full day. Our visit to Kawaza Village and the local primary school was the perfect antidote to our recent solitude. The headmaster seamlessly integrated our appearance into her geography lesson about transport – we were prime examples of walkers – and the game scout who’d been on safari with us overcame his shyness to introduce us to his wife and young son at their home. His son was too young for school, but was teaching himself to walk as we sipped tea and exchanged smiles. Walking safaris are not about keeping fit, although the combination of fresh air, scenery, and wildlife encounters meant that we returned home feeling incredibly alive. Walking through a remote, pristine corner of Africa was a very different experience to being driven through it – simply the fact that we were advancing under our own steam made the whole experience somehow more real, and more rewarding.As we only covered a relatively short distance each day – around 10km – there was always time to indulge in fascinating diversions, whether tracking leopard prints from the night before or discussing whether termite architecture inspired human air-conditioning technology.Our guide’s knowledge was comprehensive, and he left no stone unturned in introducing us to members of the so-called ‘little five’ or explaining how a particular insect or seed pod had its niche in the ecosystem.He was equally adept at managing encounters with potentially more dangerous creatures: it’s one thing to watch an ant-lion kill its prey but quite another to approach a pride of its namesakes feeding on a giraffe. At all times, we felt completely safe with our guide and the armed game scout who accompanied us.Although we spent much of each day on foot, this was not an arduous experience – the outstanding hospitality of the staff at each mobile camp (and at the permanent camps where we began and ended our luxury Zambian safari) could not have been better geared to the needs of tired but exhilarated, sunglasses-wearing wayfarers. Walking safaris are not about keeping fit, although the combination of fresh air, scenery, and wildlife encounters meant that we returned home feeling incredibly alive. 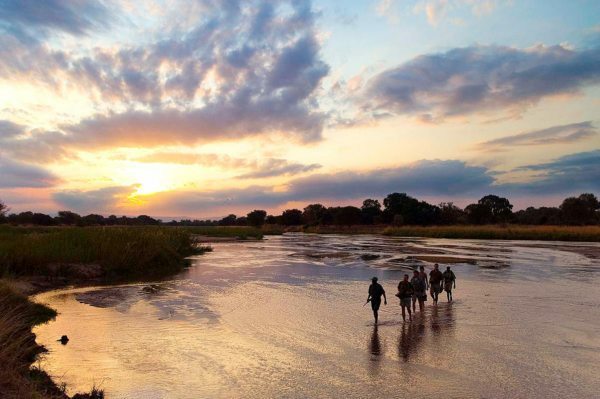 Walking through a remote, pristine corner of Africa was a very different experience to being driven through it – simply the fact that we were advancing under our own steam made the whole experience somehow more real, and more rewarding. As we only covered a relatively short distance each day – around 10km – there was always time to indulge in fascinating diversions, whether tracking leopard prints from the night before or discussing whether termite architecture inspired human air-conditioning technology. Our guide’s knowledge was comprehensive, and he left no stone unturned in introducing us to members of the so-called ‘little five’ or explaining how a particular insect or seed pod had its niche in the ecosystem. He was equally adept at managing encounters with potentially more dangerous creatures: it’s one thing to watch an ant-lion kill its prey but quite another to approach a pride of its namesakes feeding on a giraffe. At all times, we felt completely safe with our guide and the armed game scout who accompanied us. Although we spent much of each day on foot, this was not an arduous experience – the outstanding hospitality of the staff at each mobile camp (and at the permanent camps where we began and ended our luxury Zambian safari) could not have been better geared to the needs of tired but exhilarated, sunglasses-wearing wayfarers. You’ll be met as you disembark from your international flight at Kenneth Kaunda International Airport in Lusaka, and assisted through customs and immigration. 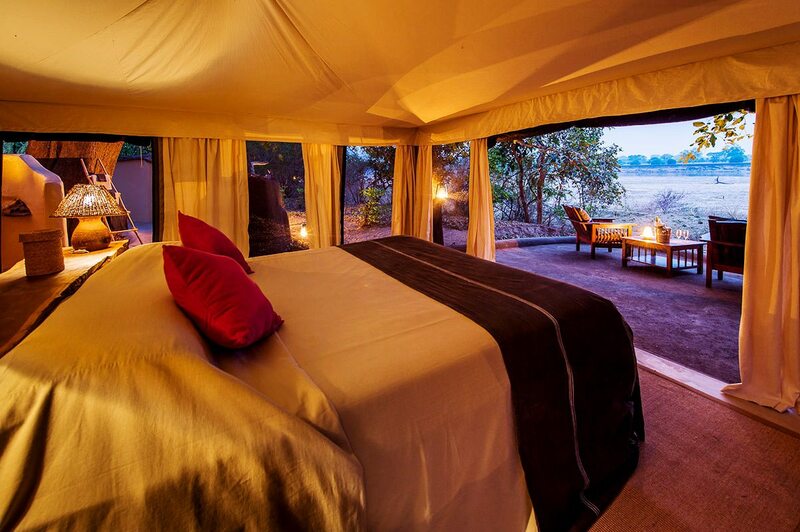 After a scheduled light-aircraft flight to South Luangwa, you’ll take a transfer to Nkwali, where you’ll spend one night. After an early breakfast, you’ll take a morning game drive from Nkwali to the first mobile camp, which will be set up ahead of you. After lunch and a rest, you’ll take a guided afternoon walk around camp, and return for sundowners and dinner under the stars. While you take a guided sunrise walk to the second site, stopping for breakfast, camp will broken down and set up ahead of you. After lunch and a rest, you’ll take a guided afternoon walk around camp, and return for sundowners and dinner under the stars. 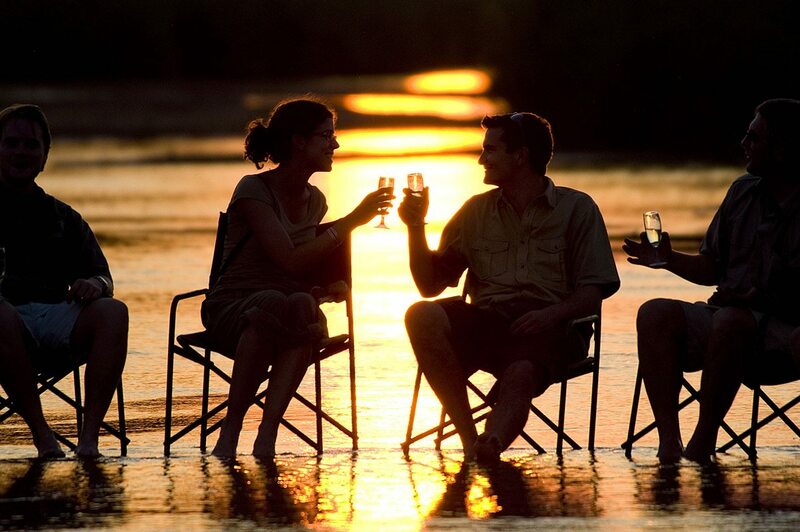 You’ll spend the day exploring the area, relaxing and enjoying bush meals. While you take a guided sunrise walk to the third site, stopping for breakfast, camp will broken down and set up ahead of you. After lunch and a rest, you’ll take a guided afternoon walk around camp, and return for sundowners and dinner under the stars. 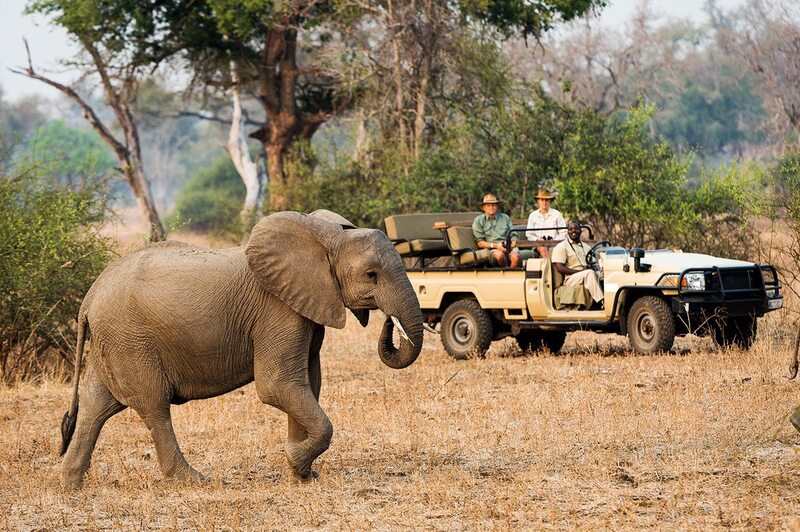 After an early breakfast, you’ll take a game drive to the Luangwa River crossing point. 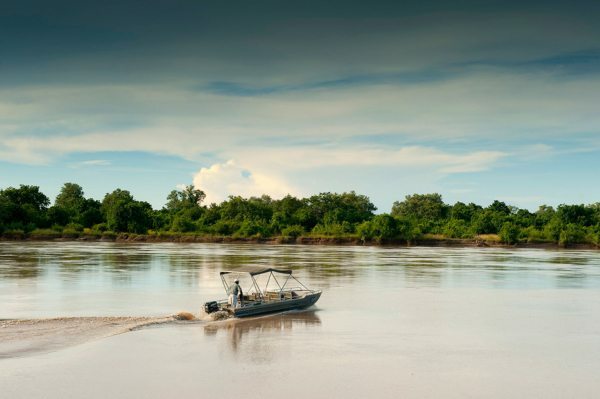 A boat trip and a transfer will take you to Tena Tena, where you’ll spend two nights. After a transfer from Tena Tena to the airport, you’ll take a scheduled light-aircraft flight to Kenneth Kaunda International Airport in Lusaka, to connect with your international flight. 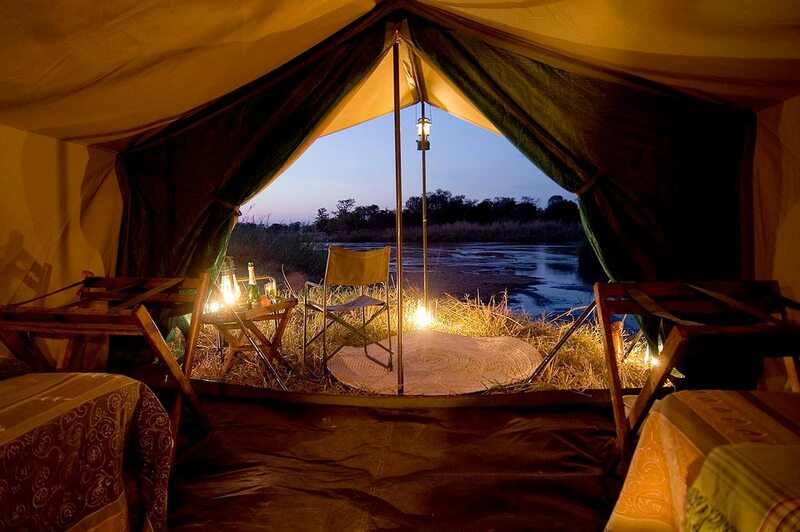 This classic affordable safari idea is simply to show you what’s possible. 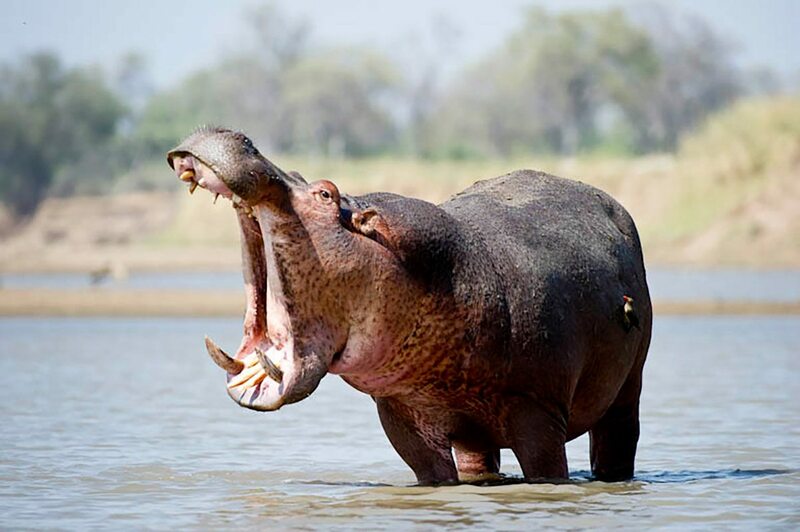 To see what this type of safari costs, and what’s generally included, click here.